Решил однажды Леонид Ильич (далее Л.И.) узнать, что на самом деле советские люди о нём думают. Прикинулся попроще и пошёл узнавать. Позвонил в первую попавшуюся по пути квартиру. Открыл ему упитанный, очень хорошо одетый мальчик (далее М.). Л.И. : А что ты сегодня кушал на завтрак? Л.И. (ободрённый таким началом диалога): А где твой папа? М.: Папа поехал покупать маме новую дублёнку. Л.И. : А на чём он поехал? Л.И. (с чувством гордости): А ты знаешь, мальчик, ведь всё это обеспечил тебе я!1! М. (радостно): Мама! Мама!1! Дядя Изя из Канады приехал!!11!! написана откровенно халтурно. Наложение сканов друг на друга есть признак попсятины и для серьёзного издания неприемлем. Придётся, если жив буду, написать собственный обзор по этой теме. Отчеканенные в том числе и в славном городе Карлсруе, те что c литерой G.
Two issues were created and sold in the United States. 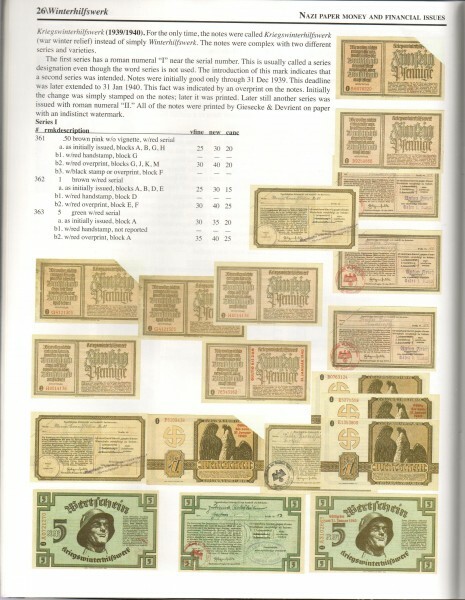 The bonds were supplemented with fractional certificates and separate coupons. 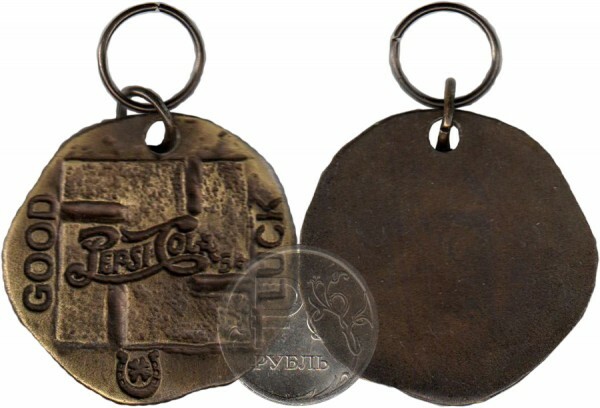 After the war, a system was established whereby bonds could be redeemed by the new German government. Bonds that were determined to be legitimately held were validated (by issuance of a validation certificate) and ultimately redeemed. For additional information on the validation system see World War II Remembered (especially the 2004 draft). to be issued. It was to include Austrian foreign debt as well as German foreign debt (since Austria had 5 already been incorporated into the Third Reich). No other evidence of these bonds has been found. 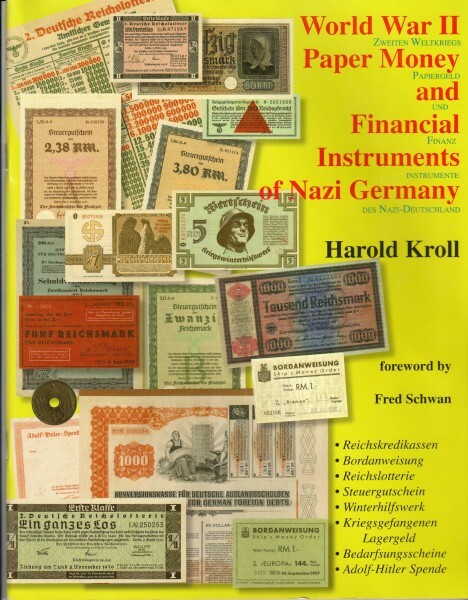 After the war, bona fide holders of specified German securities could redeem them. A system of validation was, developed. 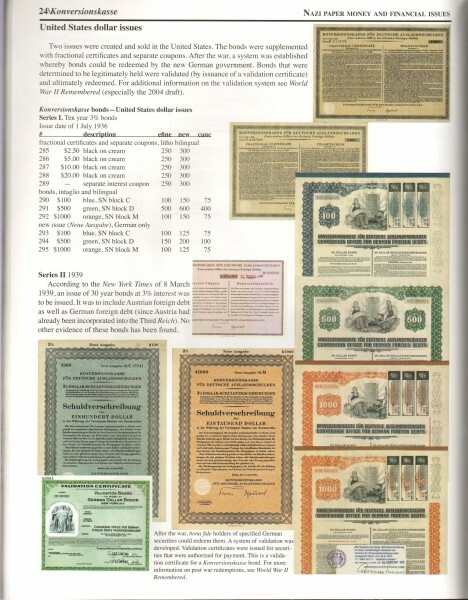 Validation certificates were issued for securities that were authorized for payment. This is a validation certificate for a Konversionskasse bond. 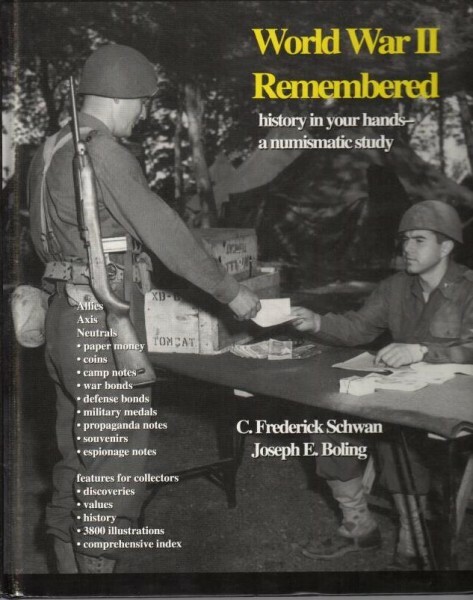 For more information on post war redemptions, see World War II Remembered. Это Winterhilfswerk des Deutschen Volkes или WHV. Тринадцать страниц сошедшего с небес сплошного благолепия. Нигде я не встречал более подробной информации по этой теме. Как всегда в подобных ситуациях меня накрыли двойственные чувства. Радость от обладания информацией оказывается несколько смазанной ощущением невозможности объять необъятное. Ещё недавно я пребывал в счастливой уверенности, что у меня не хватает двух полтинничков и одного червончика. Оказалось, что к собирательству WHV я ещё даже и не приступал. Мне казалось, что я в своём деле генерал, а я даже и не ефрейтор...... Но пара-тройка раритетов у меня есть, про которые и Harold не написал. Это то немногое, что компенсирует огорчение. Про NSDAP*овские денежные знаки и финансовые документы надо рисовать отдельный пост. 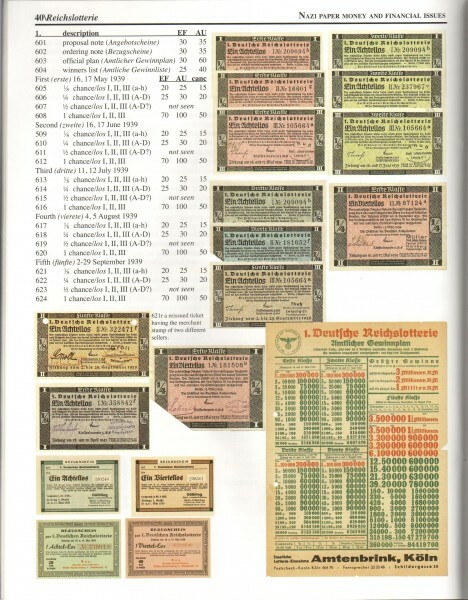 Notes good for payment of taxes ( Steuergutscheine ) were issued in 1939. 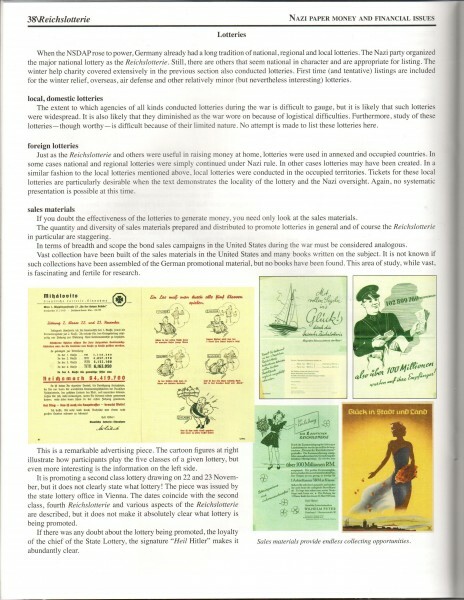 They were authorized by act of 20 March 1939 and are dated 24 March, but it is not certain when they were first actually issued, and the exact mechanism for use is unclear. 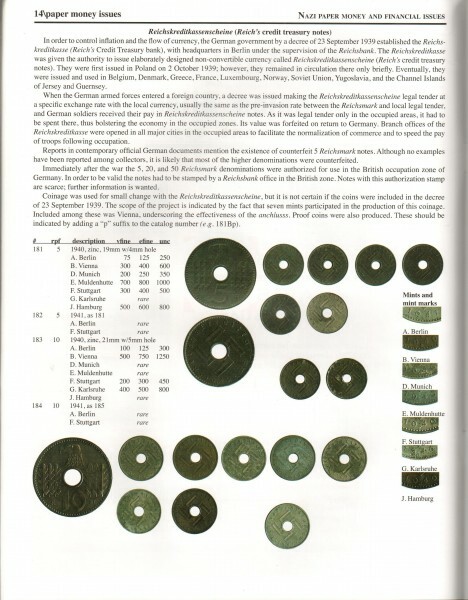 The notes include a date after which they could be redeemed for payment of taxes. One reported use was to pay government suppliers (up to 40% of payment due). 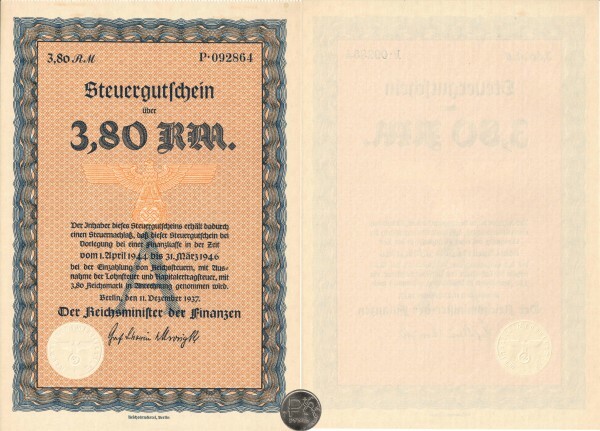 The German government issued Steuergutschein or tax remission certificates in 1932, 1937 and 1939. Despite the similar names, the three issues of Steuergutschein served different purposes. The von Papen government issued the first series in 1932 as part of the government plan to combat high unemployment. 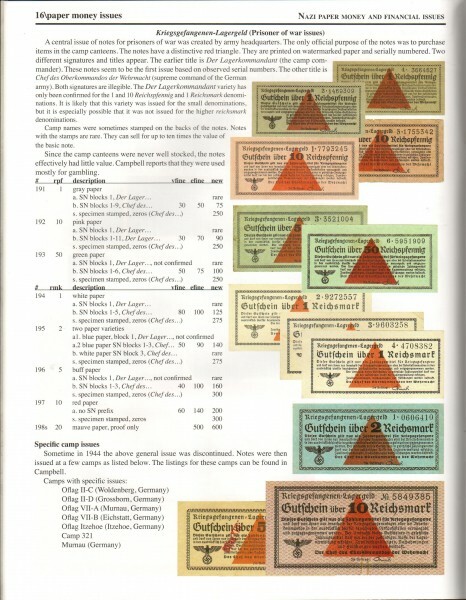 The Nazi government issued the 1937 series to loosen the midterm credit market in Germany. The final issue was part of the New Finance Plan introduced in March 1939 the purpose of which was to fund the upcoming war. It is this final issue that will be discussed further. 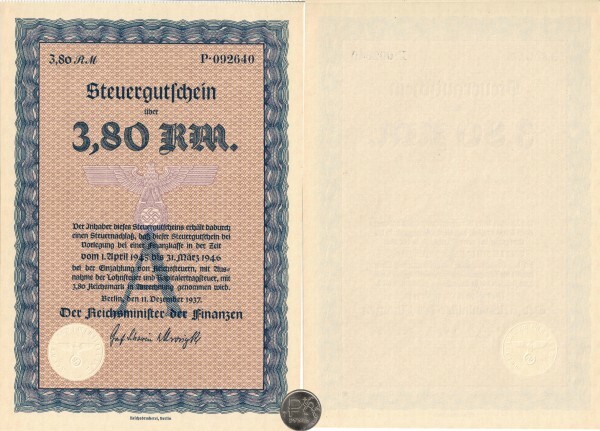 The 1939 issue of Steuergutschein was made up of three different types of certificates-Steuergutschein I and Steuergutschein II. 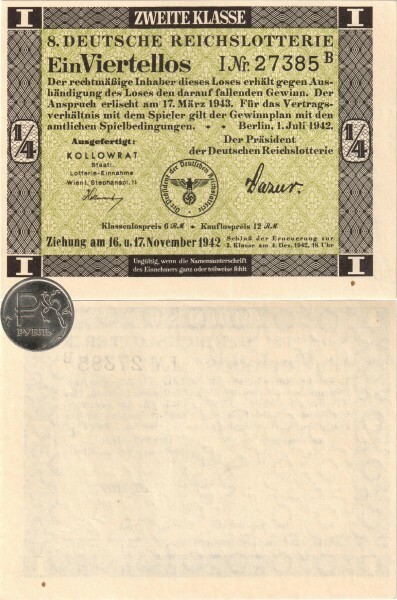 Steuergutschein I were non-interest bearing certificates that could be used at face value for the payment of all taxes and customs duties after they had been held for seven months. The holders were also entitled to an additional allowance on their income and corporate taxes. Steuergutschein II were mid-term certificates that could be used to pay all taxes and customs at a 12% premium after thirty-seven months. They could also serve as collateral for loans. Government entities (the Reich itself and provincial and city governments) and government organs like the Nazi Party, the Reichspost, the Reichsbahn. etc. paid their 40% of their debts to suppliers and contractors in Steuergutschein, 20% in Type I and 20% іп Type II. 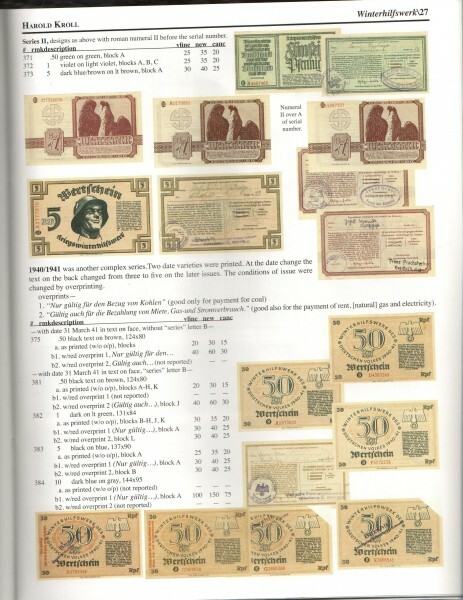 These agencies were required to pay the face amount in cash to the Reichsbank for the certificates. 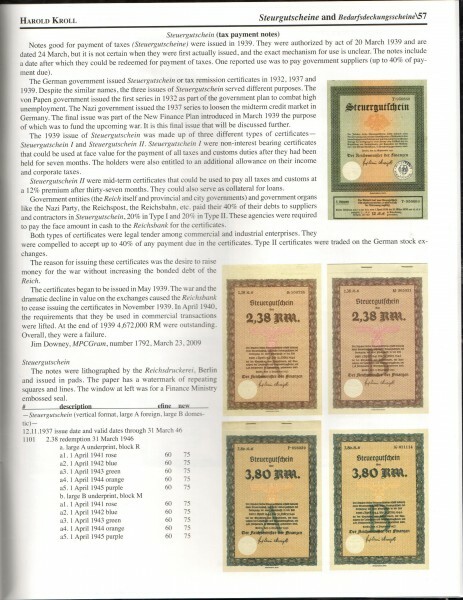 Both types of certificates were legal tender among commercial and industrial enterprises. They were compelled to accept up to 40% of any payment due in the certificates. 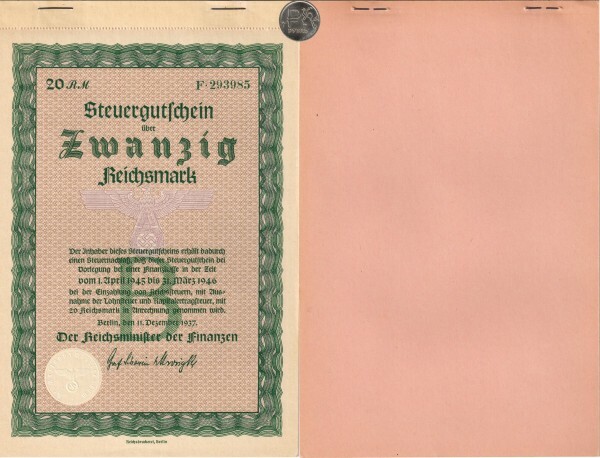 Type II certificates were traded on the German stock exchanges. 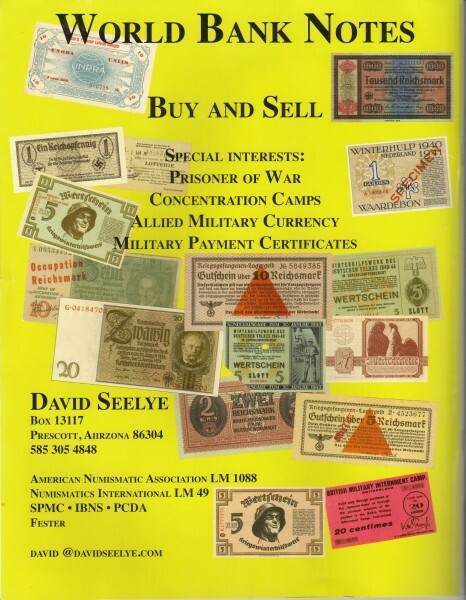 The reason for issuing these certificates was the desire to raise money for the war without increasing the bonded debt of the Reich. 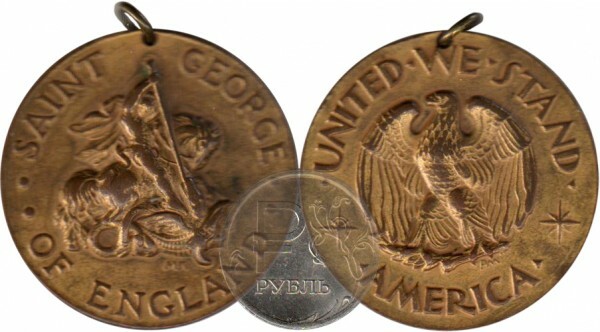 The certificates began to be issued in May 1939. 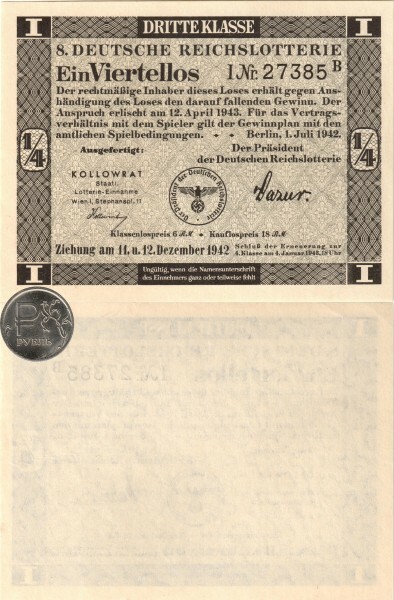 The war and the dramatic decline in value on the exchanges caused the Reichsbank to cease issuing the certificates in November 1939. 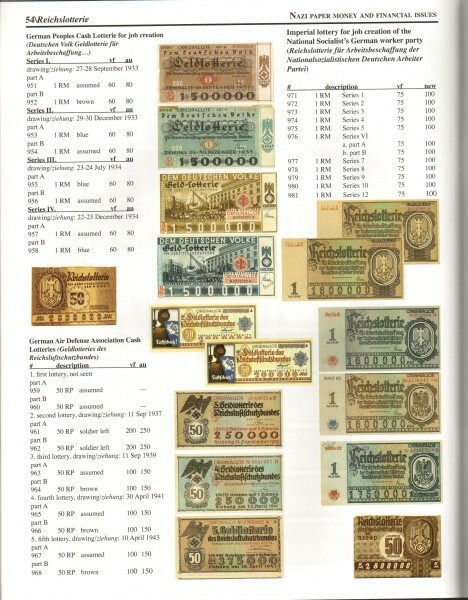 In April 1940. the requirements that they be used in commercial transactions were lifted. At the end of 1939 4,672,000 RM were outstanding. Overall, they were a failure. Error running style: S2TIMEOUT: Timeout: 4, URL: goldpekary.livejournal.com/56389.html at /home/lj/src/s2/S2.pm line 531.